The main organ of the CPSBB is the General Assembly (Figure 1). The General Assembly appoints the Director and the Executive Board (EB). Currently, members of the GA are (in alphabetical order): Alisdair Fernie, Bernd Mueller-Roeber, Dimitrina Kostova, Ivan Minkov, Maria Benina, Milen Georgiev, Saleh Alseekh, Valentina Toneva, Veselin Petrov, Zoran Nikoloski. The CPSBB departments are distinct units that perform the CPSBB core activities (fundamental and applied science, services, technology transfer etc.). Each department has its own Department Head, responsible for the established group. The Departments are controlled by the Director and the Executive Board. Next to that, an administrative and technical support unit, which includes IT support, under the governance of the Director, serves the CPSBB departments. Figure 1. 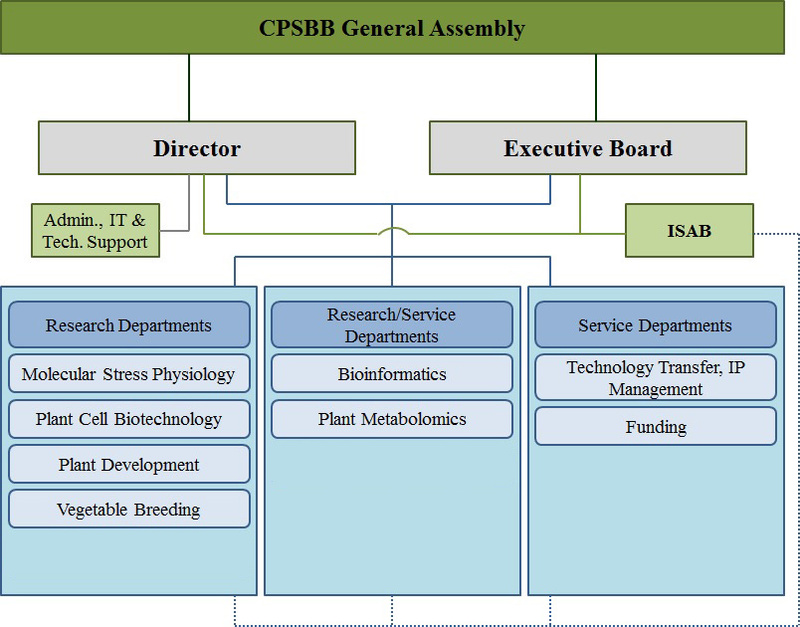 Organizational structure of CPSBB. The International Scientific Advisory Board, fully independent from the CPSBB,) functions as an external corrective of the CPSBB activities. The ISAB members are: Prof. Dr. Cathie Martin (John Innes Centre, Norwich, UK), Prof. Dr. Frank Van Breusegem (Flanders Institute of Biotechnology and University of Gent, Belgium), Dr. Paul P. Dijkwel (Massey University, New Zealand), Prof. Dr. Robert Verpoorte (University of Leiden, The Netherlands), and Prof. Dr. Stefan Hörtensteiner (University of Zurich, Switzerland).